If we go into India's recorded history, the earliest written records we have belong to the Maurya kings (4th century BC) - mostly edicts and inscriptions left behind by Emperor Ashoka - or accounts of foreigners like Megasthenes and Fahein. The Nanda dynasty, who preceded the Mauryas, are mentioned by Alexander's historians and made famous by the story of Chanakya, but they did not leave behind any physical evidence themselves. But the oldest surviving examples of human civilization on the subcontinent, unfortunately, are not very widely known. 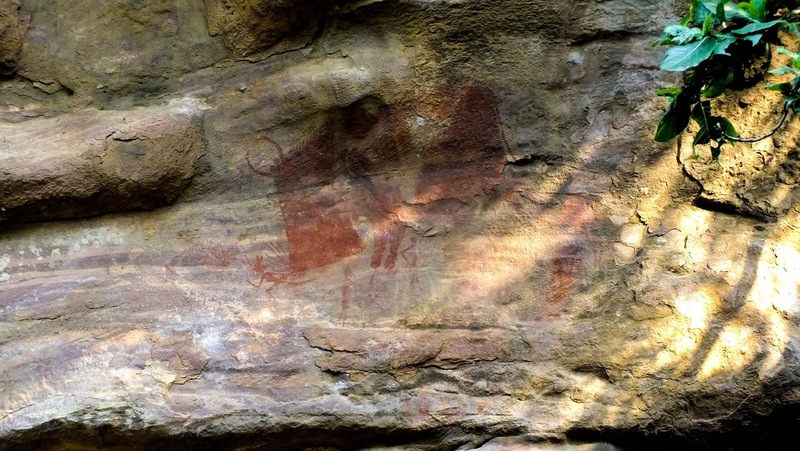 Bhimbetka, in Madhya Pradesh, is the site of paleolithic - or stone age - paintings - which date back 15,000 years. A UNESCO World Heritage site, Bhimbetka was discovered in the jungle as recently as 1957, by Indian archaeologist Dr Walwankar. Even today, it is surrounded by lush green forest and falls inside Ratapani Tiger Sanctuary (apparently leopards are not unknown in the area). Bhimbetka is only 45 km from Bhopal, about 1.5 hours drive. We were on a 5 day roadtrip in Madhya Pradesh and this was our second day of the trip. We started from Indore around 9 in the morning, after a comfortable breakfast, and cruised into Bhopal in 3 hours. The NH3, which connects Indore and Bhopal is in splendid shape and is a beautiful road to drive on. A quick lunch at the hotel and we were off to Bhimbetka. The paintings there date from 15,000 years ago upto more modern medieval times. The paintings are done on faces of rock faces where nature has provided natural shelter. 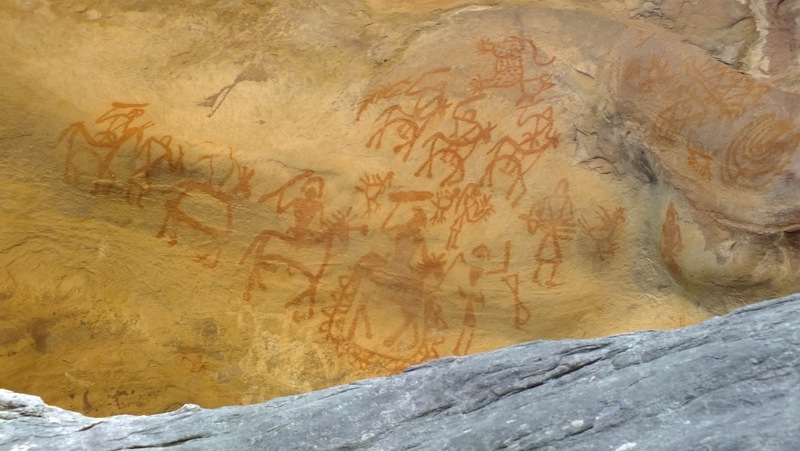 Although the rock art is spread over a ridge for about 40km, only a small section is open for tourists. 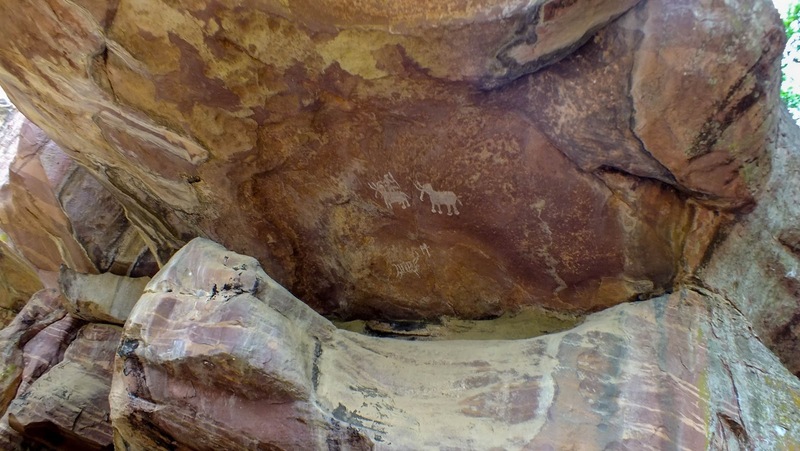 This section has a big concentration of paintings, including the famous boar painting (the face of Bhimbetka) as well as the wondrous "Zoo Rock"
The most common paintings are from iron age, when red from iron oxide became the main pigment. 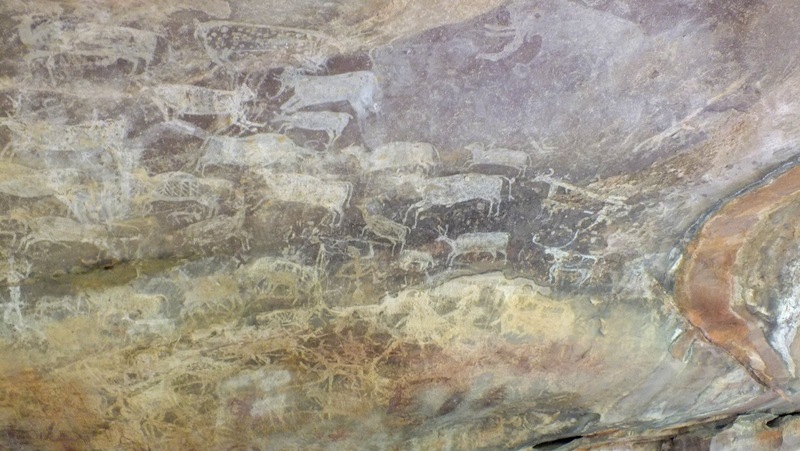 These paintings are mostly of animals or hunting scenes, as is common with most Paleolithic rock art sites around the world. One particular rock, is covered from top to bottom with animal drawings, and has been named the Zoo Rock (below).